General John Tyler Morgan — US Senator and military hero of the Civil War — was one of Cahawba’s shining sons. 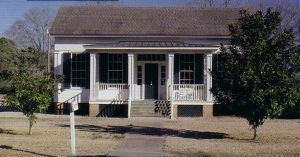 Today, the welcome center is a reproduction of the cottage that he lived in on the southwest comer of Capitol and Ash. Visitors can browse through the museum and view artifacts, photographs and treasures that reveal what life at Cahawba was like during its hey-day. The welcome center also helps visitors learn how to interpret the landscape of Cahawba today. 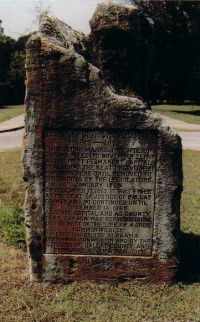 See the old National Marker placed in 1921 by the Alabama Centennial Commission. Ironically enough, the large stone marker was erected at the same time most of Cahawba’s few remaining structures were being dismantled for salvage material. Take the self-guided nature trail to Clear Creek through the woods of Cahawba’s Town Commons, a section of land reserved for everyone’s use. During the Civil War when provisions ran low, the plants and trees of the commons provided one-stop, shopping for residents’ needs. Pine, scuppernong, persimmon, prickly pear, sumac and other vegetation were utilized for a variety of practical uses that are explained along the trail. No visit is complete without seeing the Crocheron Columns, all that remains of the Crocheron mansion, where Confederate General Nathan Bedford Forest and Union General James Wilson discussed an exchange of prisoners captured during the Battle of Selma. While we have few written records about Cahawba’s African American majority, numerous sites have been identified that help tell their story. Be sure to pick up the informative brochure at the visitor’s center to discover more about Cahawba’s black heritage and history. At the bluff overlooking the Alabama River, see if you can identify the foundations of Cahaba Federal Prison. It’s in the same location that Governor Bibb wanted to construct a permanent statehouse upon the site of a Native American mound (the earthen mound was removed and used to help construct the Marion to Cahawba railroad in 1858). If its Civil War history you are interested in, a brochure is available that guides you to the most significant sites during this period, (from Castle Morgan to the memorial for Union soldiers who died in the Civil War prison to the resting places of Cahawba’s Confederate heroes. While standing on Arch Street, can you make out the fact that the concourse was originally a ditch surrounded by a palisade with an Indian mound in the center — at the site where Governor Bibb wanted to put the capitol building? 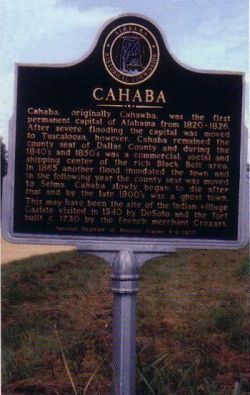 Cahawba’s “New” Cemetery, created in 1851, reveals much about the diversity of Cahawba’s antebellum community A self-guided walking tour brochure can be found at the welcome center. In the spring, be sure to ask the park rangers about numerous non-native flora that early inhabitants planted in the wilderness. Double-pink McArthur or “Cherokee roses,” old fashioned spirea in the cemetery, mock orange trees, Trifoliate Orange and a host of bulbs, paperwhites, kiss-me-at-the-gates, daffodils and more. You can also find chinaberry and mulberry trees — even a pear tree in the cemetery (how might it have gotten there? ).